Mouni Roy recently suffered a bone injury for which she has been hospitalised for two days. 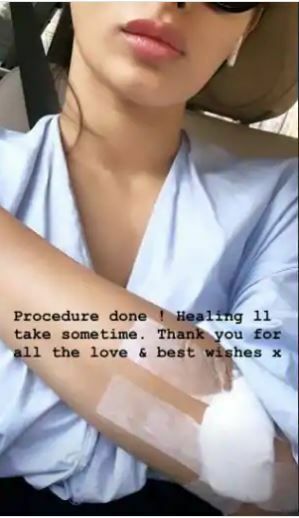 Mouni Roy, who keeps treating her fans with stunning pictures of herself in gorgeous outfits recently, met with an accident and hurt her elbow. Mouni was busy with the promotions of her next film RAW where she will be seen with John Abraham. Reports suggest that it might be a bone injury. Immediately after the accident, she was rushed to the hospital and has been admitted for two days. A source reported to SpotboyE.com, “Yes, Mouni was hospitalized in Kokilaben Ambani Hospital for 1-2 days. She had severe pain in the elbow since 2-3 days, which needed medical assistance”. Mouni even took to Instagram to share the news. She shared a picture of her injured elbow and thanked her fans for their warm wishes. Earlier talking about her film RAW, she told IANS, “I really liked the script of ‘Romeo Akbar Walter’. I remember when the film’s director Robbie Grewal was narrating the story to me… in the middle of the narration, I realised that I wanted to be a part of this film. It’s a very interesting story. It’s about a man who gives up everything for his country. He sacrifices his name, family and love.” In the film, she will be playing the role of is a simple girl who works in the bank. Mouni made her big Bollywood debut with Gold where she was seen playing the role of Akshay Kumar’s wife. Apart from RAW, she will also be seen in Brahmastra with Alia Bhatt and Ranbir Kapoor, Made In China, and Bole Chudiyaan. RAW- Romeo Akbar Walter also stars Jackie Shroff, Sikander Kher, Suchitra Krishnamoorthi and Boman Irani. The film is based on real events occurred around the India-Pakistan war of 1971. Directed by Robbie Grewal and produced by Bunty Walia, the film will hit theatres on April 5.